(2:25 p.m., Feb. 21, 2017) – The Portland Bureau of Transportation advises the traveling public that West Burnside will be fully closed to all traffic between NW Hermosa Blvd and SW Barnes Road intermittently into the Tuesday evening rush hour to allow Portland Parks & Recreation tree crews to safely remove large trees from a landslide near the roadway. Flaggers are guiding traffic through the work zone, where eastbound and westbound traffic is alternating the use of one lane. Workers are closing that one lane as needed this afternoon, and may need to continue that into the evening rush hour. Work hours had been planned to avoid morning and evening peak commute hours, to reduce the impact to the traveling public, while ensuring safe working conditions. Portland General Electric cut off power to the area to make it safe for tree removal. The work is taking longer than expected. Trees up to 100 feet tall are leaning over from the landslide, creating a hazard for the roadway. People traveling in the area should use alternate routes, and consider using NW Cornell Road or U.S. 26. 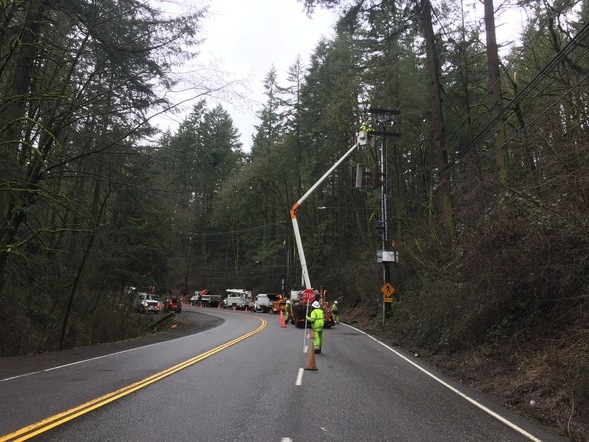 People walking or driving on West Burnside in the closure area should expect brief intermittent delays of up to 20 minutes at times as crews work to fell large trees. This stretch of road was the site of a landslide last week, and City engineers continue to monitor the area for further earth movement. We ask the public to observe all lane closures and directions by signs, reader boards and flaggers, and use alternate routes if possible. Flagging traffic through the area and lane closures may be needed from time to time on Wednesday to restore power to the area.